When I served in full-time local church music ministry it seemed to get harder and harder to enlist people to serve in roles that call for ongoing commitment. Serving as a children’s choir leader, a worship choir singer, or as an instrumentalist, all seemed too ominous for people working 50 hours or more a week, trying to maintain family relationships, taking care of aging relatives, and living in a culture that offers to entertain them in every waking moment. Can I get a witness? One of my biggest challenges was to try and get people to envision something larger than their own world of work, family, and hobbies. I knew people who were quite talented and could have contributed in worship music ministry, who spent every waking moment working at their occupation building a career or business. I remember others who spent what seemed to me an inordinate amount of time on the golf course, the tennis court, flying airplanes, fishing, or religiously following their favorite sports team(s). Add to work and hobbies responsibilities for hauling kids around to soccer, baseball, basketball, etc., etc., and becoming involved in coaching, cheering, booster clubs for these groups also (since your kid always has a better chance of playing when the parents are involved), and you have quite a crowded lifestyle. Church and worship have to be crowded in somewhere to have a place at all. If possible, we prefer that being a disciple could be squeezed in to two Sundays a month from 9:00AM to 11:30AM, except during football season when we need to be out by 11:00AM. There is hardly room for weekly rehearsals, or early arrival Sunday responsibilities. Based on conversations with many of you, not to mention now being a choir member again myself, the realities of the above paragraph continue to mount and effect churches who continue to try and foster a full-time worship ministry program. I am convinced these challenges are big-time drivers as to why many churches have adopted the worship band or praise team model, which involves far fewer players and singers. The fewer may also be more motivated in atmospheres that often resemble more hobby musician models than the educational music organization models that choirs and orchestras reflect. 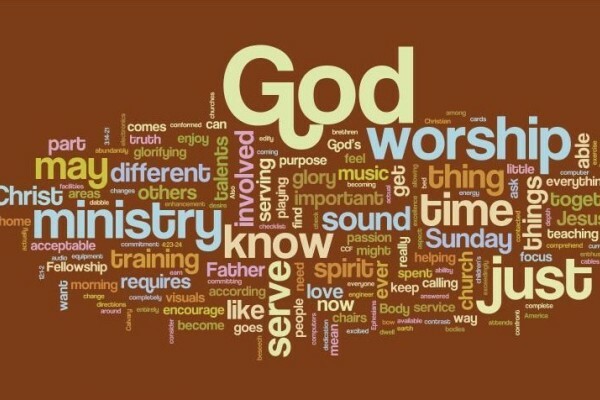 I will save the developmental issue discussion for another blog post, but at present just wish to draw attention to the trend and our need for mutual prayer support and encouragement, whichever of these models of worship music ministry you serve presently. Present culture and overall economic and social environment are working against us, no matter which model of ministry we lead. We need to understand that the misguidedness of today’s suburban lifestyle is not only the imbalance of time ratios spent – work to play to spiritual nurture, but also includes an overall erroneous worldview. Seems to me we have need to foster one of two visions. In one vision we serve a prophetic role to help people see the cultural climate for what it is, and fight against its abuses, continuing to provide developmentally sound worship music ministries that serve in the culture, but at the same time are, in fact, counter-culture. In the other vision, we attempt continued adaptation to contextualize worship ministries to meet people where they are, discovering more ways to adjust processes to try and provide ways that contemporary believers can serve given their lifestyle practices. In the case of the first vision, we must faithfully confront the tension of value systems, and share the Gospel’s power over rat race living. In a culture that worships busyness this confrontation will be a difficult struggle. In the case of the second vision, our challenge becomes a matter of providing means that are likely ever-changing. Inviting personal rehearsal accomplished through technological means (any of the planning website applications, for example) probably means a regular flow of time and financial expense for you as leader-facilitator. My experience is that in order to accommodate less time involvement for them means more time involvement for you as leader. Perhaps the biggest challenge for leaders in these two contrasting visions occurs when a church and its senior pastoral leadership determines to move from one vision to the other. Such transitions places worship music leadership on a crash course that is often akin to changing the tires on the bus while it is rolling down the highway. I am presently counseling with people moving in both directions as a result of senior pastoral leadership direction change (from choral to band, and from band to choral). In either vision it is crucial to continuously remind believers of Christ’s Lordship and help them in their quest to bring proper balance in their lives that recognizes Who “gets to narrate the world,” and help them guard against drifting into life dictated by the lies of the world. Either vision certainly can and must embrace this task. Christ’s Lordship is the supreme direction toward which each vision must point. It is the very thing that brings us together, regardless of which vision track we are on. Though we may speak dissimilar technical languages related to processes, yet we are one in the Spirit, we are one in the Lord.